Okay, so the name of this cake is kind of stupid. But, the recipe is from a children’s cookbook called Sticky, Gooey, Messy, Chewy Treats for Kids. While flipping through the book, I found a recipe for homemade marshmallows and fried doughnuts, so not really kids cooking to me. It seems more for moms to use to make fun, delicious treats for their kids. Now that my 9 month old son is eating real food, I keep a bunch of bananas around. They are easy for him to eat and he really likes them. I always try to buy extra, hoping that some will turn brown enough to use in baking. This time it worked out. I had three bananas on the border of what my husband would call disgusting. Perfect. 😀 So, I really wanted to bake something with them so they didn’t go to waste. But, I didn’t feel like my usual banana bread or banana muffins. I found the recipe for this banana cake and I thought it would be perfect. It is really moist and has a very delicate crumb due to the use of cake flour instead of all-purpose. So, the cake tastes light, although unfortunately not in calories, because it is fluffy rather than dense like banana bread. I like that the cake is sweet enough that it doesn’t even need frosting, just a dusting of powdered sugar and it is ready to serve. 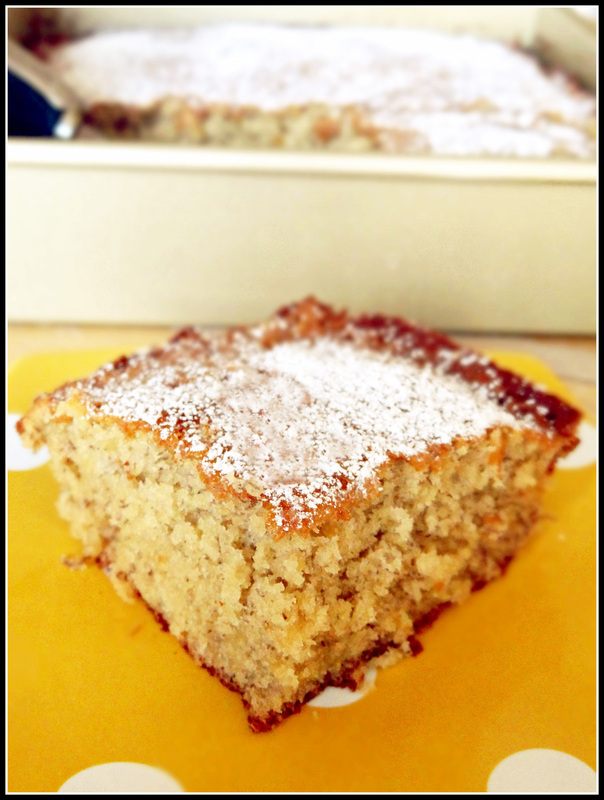 It is a quick and easy cake to throw together, as the name implies for a delicious after school snack. 1 cup mashed very ripe banana I used 3 medium bananas, smashed them and measured them in a 1 cup. It was the perfect amount. Preheat oven to 350. Spray 8 or 9 inch square pan with cooking spray. I used a 9 x 9. In a medium bowl, mix together flour, baking powder, baking soda, and salt. Sift onto wax paper or into another bowl. In a mixer bowl, cream butter and sugars on medium until light and fluffy, 3- 4 minutes. Beat in the eggs, one at a time and then beat in vanilla, bananas, and buttermilk just until combined. With mixer at low speed, beat flour mixture into the banana mixture in two additions. Beat just until combined. Do not overbeat! Using a rubber spatula, mix in pecans if using. Spread the batter in prepared pan in an even layer. Bake until firm and golden brown and a toothpick inserted near center comes out clean, about 50 minutes. Mine was ready in 40 minutes…I’d start checking at 35 minutes. Transfer to a wire rack to cool for 15 minutes. Sprinkle with powdered sugar and cut into 9 squares. Serve warm. I love anything banana… this cake looks great!! Thanks! I love banana too 😀 I’m glad I found another yummy way to use them.